Thomas Spence a schoolteacher from Newcastle-upon-Tyne arrived in London in December 1792. Soon after arriving he was arrested for selling Rights of Man by Tom Paine. For the next twenty years of his life Spence spent long periods in prison for selling Radical books, pamphlets, newspapers and broadsheets. 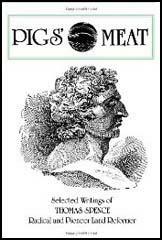 Between 1793 and 1796 Spence also published a radical periodical,Pigs' Meatand several pamphlets advocating universal suffrage and land nationalisation. Spence owned a shop called the "Hive of Liberty", in Little Turnstile, Holban but in 1801 he was arrested and imprisoned for selling seditious publications. At his trial Thomas Spence called himself the unpaid "advocate of the disinherited seed of Adam". After Spence's release he opened a shop in Oxford Street. The business was not a success and he eventually ended up selling broadsheets, handbills, newspapers and pamphlets from a barrow. By the early 1800s Thomas Spence had established himself as the unofficial leader of those Radicals who advocated revolution. The group included Thomas Preston, John Hopper, Thomas Evans, Allen Davenport, Robert Wedderburn, Arthur Thistlewood, James Watson, James Ings, John Brunt, William Davidson and Richard Tidd. Spence did not believe in a centralized radical body and instead encouraged the formation of small groups that could meet in local public houses. At these meetings Spence argued that "if all the land in Britain was shared out equally, there would be enough to give every man, woman and child seven acres each". At night the men walked the streets and chalked on the walls slogans such as "Spence's Plan and Full Bellies" and "The Land is the People's Farm". In 1800 and 1801 the authorities believed that Spence and his followers were responsible for bread riots in London. However, they did not have enough evidence to arrest them. The government became very concerned about this group and employed a spy, John Castle, to join the Spenceans and report on their activities. In October 1816 Castle reported to John Stafford, supervisor of Home Office spies, that the Spenceans were planning to overthrow the British government. On 2nd December 1816, the Spencean group organised a mass meeting at Spa Fields, Islington. The speakers at the meeting included Henry 'Orator' Hunt and James Watson. The magistrates decided to disperse the meeting and while Stafford and eighty police officers were doing this, one of the men, Joseph Rhodes was stabbed. 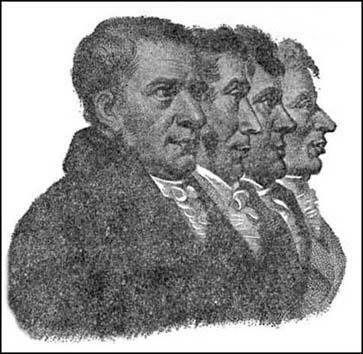 The four leaders of the Spenceans, James Watson, Arthur Thistlewood, Thomas Preston and John Hopper were arrested and charged with high treason. Watson was the first to be tried. However, the main prosecution witness was the government spy, John Castle. The defence council was able to show that Castle had a criminal record and that his testimony was unreliable. The jury concluded that Castle was an agent provocateur (a person employed to incite suspected people to some open action that will make them liable to punishment) and refused to convict Watson. As the case against Watson had failed, it was decided to release the other three men who were due to be tried for the same offence. In 1817 the government decided to try again to suppress the Society of Spencean Philanthropists. One of its members, Thomas Evans, was arrested and charged with high treason. Robert Wedderburn responded to this by establishing the journal, The Forlorn Hope. In the first edition Wedderburn argued that the journal would "establish something in the shape of a free press". It also included an article on the imprisonmemt of Thomas Evans and his 20 year old son. Government spies who infiltrated the Spenceans claimed that Wedderburn was now the leader of the group. One spy attended a meeting held at the Mulberry Tree tavern. In his report he claimed that 150 people attended the meeting. As well as making a speech Wedderburn read from the writings of William Cobbett, William Sherwin and Jonathan Wooler. Robert Wedderburn also opened his own Unitarian chapel in Hopkins Street, Soho. Government spies were soon reporting that Wedderburn and Allen Davenport were making "violent, seditious, and bitterly anti-Christian Spencean speeches." In 1819 it was reported that up to 200 people were paying 6d. a head to attend debates organized by Wedderburn. He also gave sermons every Sunday, or in the words of Wedderburn: "lectures every Sabbath day on Theology, Morality, Natural Philosophy and Politics by a self-taught West Indian". A government spy claimed that at one meeting Wedderburn argued that a slave had the right to kill his master. This resulted in Wedderburn being arrested and charged with sedition and blasphemy. He was sent to Newgate Prison but was later released when his followers raised £200 bail money. Spenceans were quick to condemn the Peterloo Massacre and on the 13th September Robert Wedderburn held a special meeting on the subject at his Hopkins Street chapel. Wedderburn argued that "an act of murder had been committed by the magistrates and yeoman". The following month Wedderburn told an audience that the revolution was about to begin and that all working men "should learn to use the gun, the dagger, the cutlass and pistols". George Ruthven, another government spy, discovered that the Spenceans were planning an armed rising. One of the leaders of the Spenceans, Arthur Thistlewood, claimed at one meeting that he could raise 15,000 armed men in just half an hour. As a result of this information, John Williamson, John Shegoe, James Hanley, George Edwards and Thomas Dwyer were also recruited by Stafford to spy on the Spenceans. On 22nd February 1820, Edwards told John Stafford that Thistlewood had discovered that several members of the British government were going to have dinner at Lord Harrowby's house at 39 Grosvenor Square the following night. According to George Edwards, Thistlewood and twenty-seven other Spenceans were planning to break into Harrowby's home and murder all the government ministers who were there. Thistlewood's gang planned to assemble in a hayloft in Cato Street, a short distance away from Grosvenor Square. As George Ruthven knew the men, he was given the task of leading the thirteen police officers into action. Several members of the gang refused to surrender their weapons and one police officer, Richard Smithers, was killed by Arthur Thistlewood. Four of the conspirators, Thistlewood, John Brunt, Robert Adams and John Harrison escaped out of a window, but the police spies knew who they were and all four were arrested during the next couple of days. Eleven men were eventually charged with being involved in the Cato Street Conspiracy. Charges against Robert Adams were dropped when he agreed to give evidence against the other men in court. On 28th April 1820, Arthur Thistlewood, James Ings, John Brunt, William Davidson and Richard Tidd were found guilty of high treason and sentenced to death. John Harrison, James Wilson, Richard Bradburn, John Strange and Charles Copper were also found guilty but their original sentence of execution was subsequently commuted to transportation for life. Landed property always was acquired by conquest or encroachment on the common property of mankind. The public mind is being suitably prepared by reading my little tracts. A few parishes have only to declare the land to be theirs and form a convention of parochial delegates. Other adjacent parishes would follow the example, and send their delegates and thus would a beautiful and powerful new Republic instantaneously arise in full vigour. The power and resources of war passing in this manner in a moment into the hands of the people. Awake! Arise! Arm yourselves with truth, justice, reason. Lay siege to corruption. Claim as your inalienable right, universal suffrage and annual parliaments. And whenever you have the gratification to choose a representative, let him be from among the lower orders of men, and he will know how to sympathize with you. 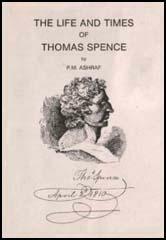 (3) In 1801 Thomas Spence wrote and published a pamphlet attacking large landowners, including the Duke of Portland, the Home Secretary. Spence was arrested and found guilty of seditious libel. What must I say to the French if they come? If they jeeringly ask me what I am fighting for? Must I tell them, "for my country"? My dear country in which I dare not pluck a nut? Would they not laugh at me? If the French came I would throw down my musket, saying: "Let such as the Duke of Portland, who claims the country, fight for it." (4) Part of a police spy's report of a Spencean Society meeting at the White Lion in Camden on 21st July, 1819. Hartley: You are all cowards, let us try what can be done with physical force. Watson: It is no use till the country is ready. I will lose my life as well as the rest, but till the time comes it is only exposing ourselves. Thistlewood: We shall all be hanged. I am not such a fool to suppose nor to advise that the poor and half starved part of the population should meet the regular army of the Borough mongers in the field because they would have no chance, one party being armed & the other not, but arms are now preparing as fast as the means of paying for them will admit. We must all learn to use the gun, the dagger, the cutlass and pistols. We hall then be able to defy all the Yeomanry of England. (7) Report by George Edwards of a Spencean meeting in December 1819. Preston spoke at great length; he quoted a Persian who overthrew fifteen hundred thousand Grecians and made them free. Ings bought twenty-four poles for pikes. In the evening Bradburn sawed the ends square. Harris showed me nine swords that he had been sharpening on the Sunday morning. Where, after all, is my crime? It consists merely in having spoken in the same plain and homely language which Christ and his disciples uniformly used. There seems to be a conspiracy against the poor, to keep them in ignorance and superstition; the rich may have as many copies as they like of sceptical writers; but if I find two most decided contradictions in the bible, I must not in the language of the same book assert that one or the other is a lie. As to my explanation of the doctrines of Christ, I must still maintain it to be particularly faithful. He was like myself, one of the lower order, and a genuine radical reformer. Being poor himself, he knew how to feel for the poor, and despised the rich for the hardness of their hearts. His principles were purely republican; he told his followers they were all brethren and equals, and inculcated a thorough contempt for all the titles, pomps, and dignities of this world. As nature has blest me with a calm and tranquil mind, I shall be far happier in the dungeon to which you may consign me, than my persecutors, on their beds of down.